On a warm Sunday morning twenty-five years ago I was sitting on the ledge of what was then a Duke Power appliance store near my temporary office in the restored Kress Building looking down Main Street in Durham, North Carolina. This was my first week of spearheading what was my third and final community-destination marketing start up. I felt an incredible sense of urgency but I also knew by that half-way point in my career, that to leapfrog much more established competition we had to do things differently. To me that meant not only differentiating Durham as place to visit but differentiating the very way we marketed it to potential visitors, It would need to be very different or highly evolved from anything I had done in my previous two communities. Peers then, and far too many now, thought that this was weird. The prevalent mantra was an approach best described as hyperactive, cookie-cutter follow the leader. But two resources I had read a few years earlier kept ringing in my ears - an essay on “sense of place” by Dr. Wallace Stegner, who coined that term, and the definitive primer on strategy by Dr. Michael Palmer. Later I would conduct studies to drill down more completely into Durham’s personality, but to begin with, start ups have to skim characteristics on the fly. Running through my mind that day as I looked down Main Street were Durham values and personality characteristics I had already sensed. In marketing parlance this is called honing in on a community’s brand, the nexus of internal and external perceptions. The first apt descriptor to come to mind regarding Durham was genuine, real. Quickly following that came diverse and eclectic which morphed to textured and finally, authentic, the core trait. Few communities back then valued, let along exhibited those traits, preferring instead, a rush to replicate others in the geography of anywhere. If they did any branding at all, they confused it with aspirations. But I didn’t have to be in Durham but a few hours and days to know these were among Durham’s core, almost temporal values. Later research confirmed and deepened snap judgments made when that’s all time would allow. Being able to discern those traits probably came from pre-school explorations around our ancestral ranch, or perhaps gleaned while earning a degree in history. Maybe it was just plain luck or a combination of all three. While I quickly tested these descriptors on two community elders, individuals with roots going back before Durham’s founding, I already had some idea of what they meant in other contexts such as when a decade earlier the late Dr. Christopher Lasch had written about authenticity in a social context. But I became a student of “authenticity,” particularly Durham’s, where it was so deeply rooted compared to other communities. There had to be a reason they did things so differently from its founding, such as those neo-Romanesque chimneys on historic warehouses here. Five years later, I snapped up her new book, In Search of Authenticity, to learn more about the “longing” for it spurred by cultural influences such as modernization. This led me to believe that is what motivated Durham’s founders to embed it so deeply here. It was a counterbalance to the tobacco, textile and other factories we are repurposing today for the creative class. It also explains why, after creating some of the world’s largest trusts and revolutionizing North Carolina’s economy after the Civil War, Durham turned to the preservation of historic sites only a few decades after the founding. I knew that if we couldn’t trace authenticity, we wouldn’t be able to explain it, nor would we be be able fulfill our organization’s charge to be the guardian of that essence of Durham’s sense of place. The term “authentic” wasn’t applied much to other places until a decade after my insight when at the end of that century, historical novelist Dr. Michael Crichton inserted a prescient line in his 1999 book Timeline, about a team of historians and archeologists who time travel back to 1357. Two years later, as if on cue, authenticity surfaced in research published by Dr. Richard Florida describing places most appealing to the creative class, a bellwether to community economic vitality. Back then, while fronting for business interests, supply-side economic developers (tourism is demand-side) were in the midst of a more than two-decade frenzy to push for public cultural facilities such as convention centers and particularly performing arts centers as a a means to, in turn, more easily leverage capital from lenders. In the pretense of spurring development, nationwide they pushed through $16 billion in arts facilities alone during this period, more than half on performing arts centers, with the greatest increase occurring in the four years between 1998 and 2001. Analysis shows that it paid off handsomely for adjacent developments but had negligible impact beyond. Later I will explain why this binge had the unintended consequence of hollowing out so much community authenticity across the country. In the 2000s, “oh-that-too” marketers ubiquitously tried to obliterate the meaning of authenticity with phony applications. To the rescue came a 2006 speech/essay entitled The Geography of Somewhere by Dr. Scott Russell Sanders, followed a year later by the definitive book entitled, Authenticity: What Consumers Really Want, by James H. Gilmore and B. Joseph Pine II. They summarize why it is so hard to communicate authenticity, because it is often perceived by what it isn’t. It isn’t commercial. It isn’t fake. It isn’t monetary, etc. 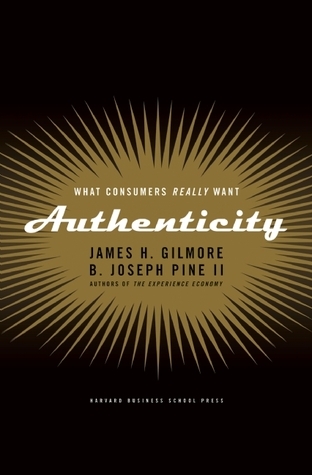 But derived from Shakespeare’s Hamlet, Gilmore and Pine distill what they call the two principles of authenticity, applied here to communities: An authentic place is true to itself and strives to be always true to what it says it is. Authenticity isn’t created, its nurtured. Working with researcher John Henry of H2R Market Research, PGAV Destinations, a company that has created or revitalized attractions visited by 75 million people each year, has conducted the definitive analysis of perceptions of authenticity. historic sites/museums, parks/preserves/botanical gardens, performing arts, zoos/aquariums, art galleries/museums, amusement/theme parks, sports (spectator and participatory,) festivals/events, gaming and of course shopping and dining. By nearly 4-to-1, travelers prefer destinations that are real and authentic over those that are fantasy, but fewer than 1 in 3 destinations visited in the previous year met those qualifications. However, people view authenticity on a continuum with historical and natural attractions most authentic and, for example, performing arts (especially musical theater-sorry Broadway) as least authentic, with things like science centers and botanical gardens in the middle. Each type of attraction also fits on an authenticity continuum with independent-locally owned stores most authentic while malls and formula stores least authentic. Local-chef owned restaurants serving locally grown foods including heirloom veggies are most authentic whiled national restaurant chains are least authentic. 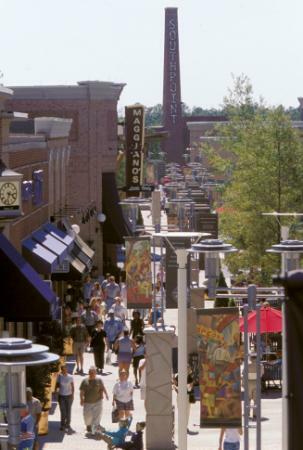 Those least authentic must strive to let a community’s authenticity rub off, such as The Streets at Southpoint, a super regional mall in Durham did with faux architectural details. Of course, communities need a mix but to retain appeal as authentic, they must vigilantly manage the mix so that things most real and authentic are never taking a back seat to things fantasy. That is, if like Durham, they are fortunate to have any left. Trying to straddle is a sure way to becoming Anywhere, USA.